I recently blogged about a Brown Bread Frozen Yogurt I made. In the picture, I added a little something else which I had made with some curiosity. I stumbled across a recipe for Anzac biscuits in an old magazine and thought they sounded really delicious. Oats, coconut, honey... what more could you want from a biscuit! When I looked a little more into the history behind them, they really caught my interest and I couldn't resist a chance to literally taste history! Anzac biscuits originate from the World War I era and more specifically belong to the history of the Australian troops (Australian and New Zealand Army Corps) who were at the time, fighting far away in Turkey. The troops were sent these chewy treats by their loved ones.The oat and coconut biscuit acted as a substitute for bread, or could be crumbled up and used to make porridge. Everyone knows that the way to a man's heart is through his stomach. That is certainly true of my own man and he appreciated them very much. I can't comprehend the warmth they must have brought to those men at that time. Quite frankly, they are one of the most delicious biscuits I have ever had. They are still enjoyed in Australia and remain a part of the care packages sent to Australian and New Zealand troops today, which is a wonderful tradition and a true symbol of compassion for what they do. 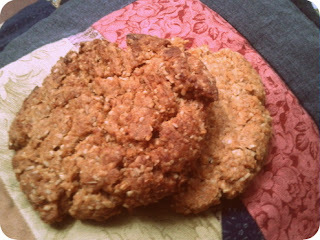 Anzac biscuits are particularly enjoyed on April 25th ANZAC Day, a memorial day for the men lost in the terrible war. 1. Grease and line a baking tray and preheat your oven to 170C. 2. Sift your flour and stir in the oatmeal, sugar, and coconut. 3. Melt the butter and honey in a saucepan on a low heat. Once melted, mix your water and bicarb in a cup and pour into your butter mixture. This will cause a reaction so you must mix them together quickly and then add to your dry ingredients. 4. Using a spoon mix everything together into a thick dough. Take spoons full and roll between your palms, then flatten onto your baking tray allowing enough room for the biscuits to grow during cooking. 5. Bake for 20mins, once golden remove from the oven and allow to cool before transferring to a container. They will keep for a long while, but may not make it that long in your biscuit tin!